Click image to enlarge. For more Wordless Wednesday, click here. Is it the arts behind arts? That's one heck of a fabulous shot! You have an amazing knack for capturing intriguing photographs! Very interesting reflection, at first I tought it was a pice of art until I read the title. Very cool shot! It does look like an interesting piece of art. 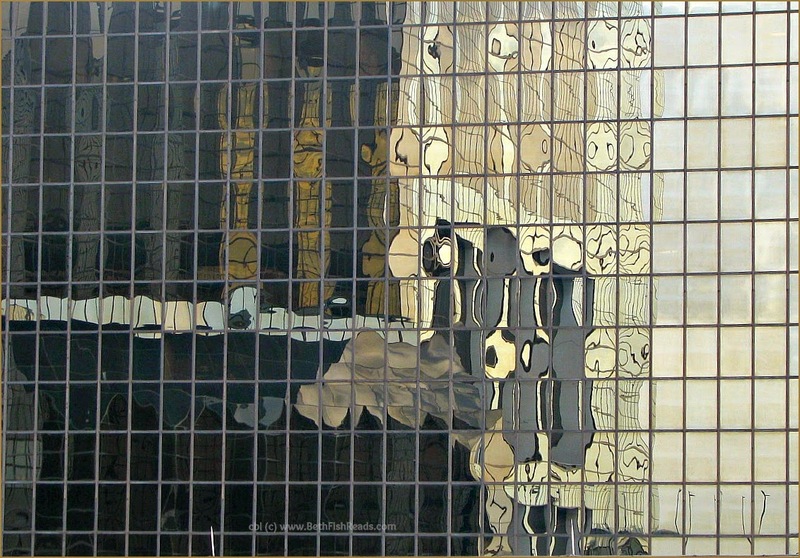 I am fascinated by shots of reflections in building; there is something very artistic about it! Great shot! Very cool. It's like reflections in a vertical lake. I had a migraine yesterday and everything I came across this picture, it tripped me out! Today, I'm better and can appreciate it much better. You take the most interesting shots. I love it! Thanks for stopping by. I read all comments and may respond here, via e-mail, or on your blog. I visit everyone who comments, but not necessarily right away. I cannot turn off word verification, but if you are logged into Blogger you can ignore the captcha. I have set posts older than 14 days to be on moderation. I can no longer accept anonymous comments. I'm so sorry if this means you have to register or if you have trouble commenting. I'm a freelance book editor, reviewer, and journalist blogging as Beth Fish. On these pages, you'll find book reviews, book features, and other bookish content. I like to spotlight my favorite imprints and I'm a long-time audiobook lover. (I was the Audio Publishers Association's 2016 Audiobook Blogger of the Year!) Each Saturday I host my popular Weekend Cooking feature. Don't forget to look for my weekly photograph. You can find me on social media as @BethFishReads. Publicists, publishers, authors: please see my review policy. NB: I did not work on any book mentioned on this site. All photos (including the banner; Brugge 2008) and text (unless otherwise noted) are my own work and are copyrighted under my legal initials. Please read "Copyright issues" in my Review Policy for more on the legal use of my material. All content and photos (except where noted) copyright © cbl for Beth Fish Reads 2008-2019. All rights reserved. To The Blogger Guide, Blogger Buster, Tips Blogger, Our Blogger Templates, BlogU, and Exploding Boy for the code for customizing my blog. To Old Book Illustrations for my ID photo. To SEO for meta-tag analysis. To Blogger Widgets for the avatars in my comments and sidebar gadgets. To Review of the Web for more gadgets. To SuziQ from Whimpulsive for help with my comments section. To Cool Tricks N Tips for my Google +1 button.